March 18, 2015 – America’s most visited museum, Smithsonian’s National Air and Space Museum in Washington, D.C., is now featuring the work of Lockheed Martin engineers. Installed today, a giant video wall shows the sun in super high-definition using the Atmospheric Imaging Assembly (AIA), designed and built by experts in Lockheed’s Palo Alto Advanced Technology Center together with colleagues from the Smithsonian Astrophysical Observatory. AIA is an instrument on NASA’s Solar Dynamics Observatory, to which the exhibit is dedicated. Using specialized filters to cut through the glare, AIA routinely takes super-high-definition (HD) photographs of solar flares, erupting magnetic filaments, and “solar tsunamis” big enough to engulf our planet 100 times over. No previous observatory has been able to observe the whole sun with such depth or clarity. Palo Alto’s connection to solar science is strong. NASA’s principal investigators for several sun-staring telescopes call Lockheed Martin’s Advanced Technology Center home. Over the years, Lockheed Martin’s scientists have supported each major solar science mission the U.S. has produced, as well as cooperative projects with Europe, Japan, and a close collaboration with scientists at Stanford University. 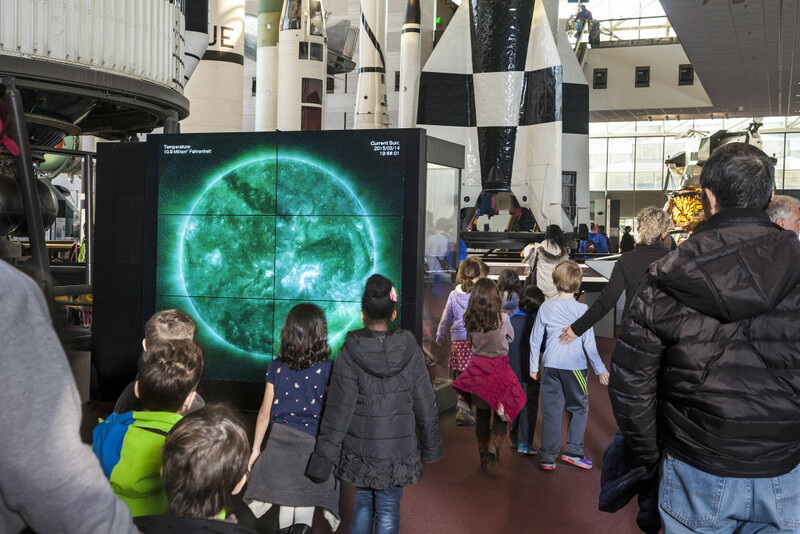 The Smithsonian’s Dynamic Sun Video Wall combines six 50-inch monitors to create a 7 by 6 ft. display. AIA’s images of the full sun’s atmospheric layers have an image size of 4096 x 4096 pixels. By comparison, a high-definition TV can only display 1920 x 1080 pixels. The museum’s video wall will demonstrate to visitors why images at this resolution are needed to study and predict solar behavior. Five years after its launch, AIA’s powerful set of four parallel telescopes, with 10 different channels, has delivered far more data than any previous space-based solar observatory. In fact, the instrument recently delivered its 100 millionth image. SDO launched on February 11, 2010 from Cape Canaveral Air Force Station Space Launch Complex 41, utilizing a United Launch Alliance Atlas V-401 rocket.